Hardy in zones 4-8. Blooms in Augut and September Prefers damp, acidic soil Loves the sun or part-sun Height: 20" Width: 24" Shipping in 2x3" pots. Shipped dormant in the winter. Callunas' tiny, scalelike leaves range from deepest green to silver, gold and bronze, with some changing color after a frost. Flowering from mid-to-late summer in cool whites, pinks and purples, the small, bell-shaped flowers are frozen in graceful repose on one-sided spikes. Heathers are marvelous fresh or dried. Scotch Heather 'Silver Knight' is one of the best grey foliage Heathers. Soft, silvery-grey foliage on erect branches deepens in winter to purple/grey. 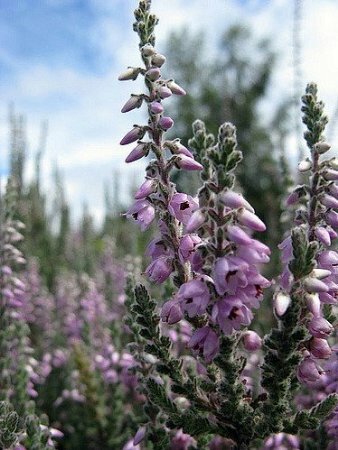 A mainstay in any Heather garden. Thrives in full or at least a half day sun with a S.E. exposure and a well drained, slightly acidic soil with plenty of organic matter to retain moisture. Excellent in mass plantings with other Heaths and Heathers or in the rock garden. Prune back each spring to ensure dense branching and a good show of flowers.